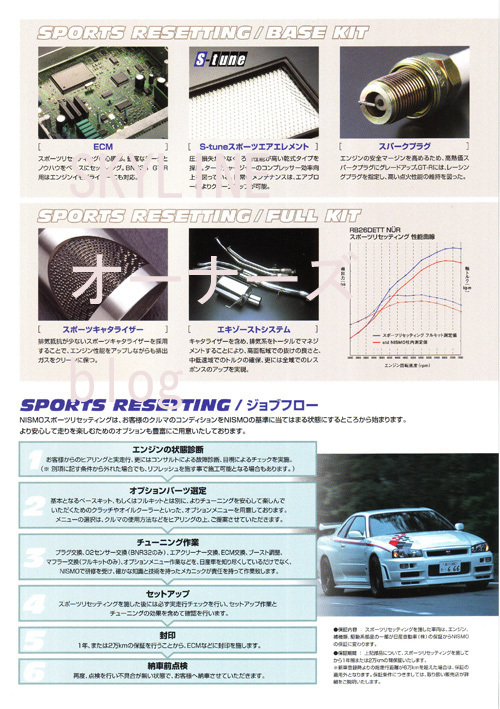 Note: Sports Resetting was available separately which two different types, a base kit of a computer (ECU) with tune, spark plugs and a sports air filter, and a full kit which also includes an exhaust system for a standard R34 GT-R. S-Tune Sports Resetting is a S-Tune that does not have the S1 engine, but has the Sports Resetting computer and tune on standard engine. 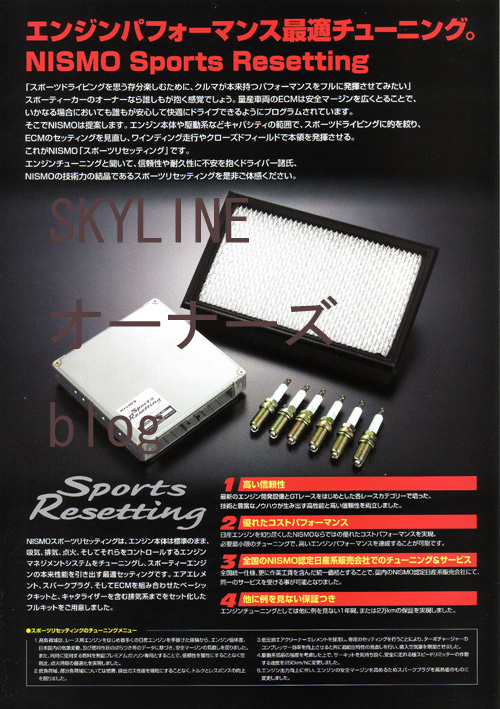 S-Tune, Sports Resetting Package is a light tune to run with increased engine power. 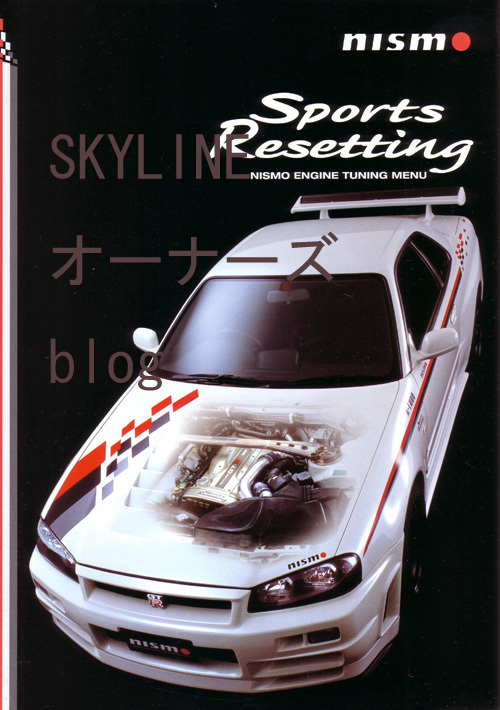 This tuning package is aimed at maximizing the potential of the RB's engine modifying the engine. 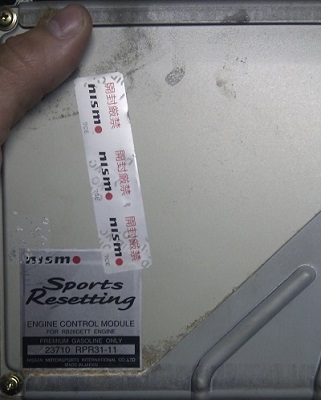 "Sports Resetting" is the first step of engine tuning employed by Nismo, and a sporty feeling is obtained without sacrificing reliability. Easy to handle on the street, it is a package that obtains the pleasure of driving a car with driving performance higher than normal by using a suspension that follows the road surface and a clutch with excellent operation. We will tune from ECM and ignition system etc to evolve more sporty engine characteristics. By reviewing the safety margin provided in the production specification with the technology of Nismo, we have realized the good response in the low and medium speed range while power output is sustained in the higher rpm range. "Sports clutch kit" using a phenomenal new material Copper Mix that goes beyond metal realizes stable torque transmission and easy handling which is not affected by thermal change. Boasting a feeling of operation like a genuine clutch, it is a clutch system that anyone can use normally. Chassis tuning that is "easy to handle". The "S-tune suspension system" boasts steering stability that follows the ground even when traveling on high speeds and rough roads. The "S-tune brake pad" and "brake hose set" improve not only the braking power, but also squeak and dust reduction, while the pedal feel and response are improved. The wheel is a one piece forged "LMGT4" in gold model specificically for NISMO package cars. A reduction of unsprung load, high rigidity, high strength are realized. The exterior is filled with a wealth of expertise that Nismo received during the development of race cars. We tried to increase downforce by improved aerodynamics derived by wind tunnel development. As well as reducing drag coefficient, we have enhanced the cooling effect of the engine room and the brakes. The rear is fitted ith a three-dimensional metal emblem exclusive for NISMO package cars. Combination meter with 320 km/h, and "Floor Mat" which enables quick pedal function and improve grip for the heel. Stimulates the driver's driving, and adopts functional interior parts. Vehicle comes with original car validation.